What goes up, if you’re not careful, can come down! When it’s time to clean your gutters, more than likely, your first thought is “Oh no, here I go again, back up on that wobbly ladder of mine.” Ladder safety is paramount and the safest thing you can do is not go up on one ever again. There’s an easy solution and that is to call Wood and Wood Seamless Gutters. They’re the gutter cleaning professionals that you want up on their ladders while you watch, safely, from your living room window. They’re not only the best in the business but they’re as affordable as can be. First off never ever go on a ladder if it’s windy out or there’s a storm brewing. If you’re kind of tired or you lose your balance easily, maybe being a ladder is not in your best interest. The footwear you use is an important consideration and leather soled shoes are a definite no no. Now this might sound like a no brainer but make sure your ladder is in good working condition. That means there are no missing parts and that it is simply not a rickety old thing that sways to and fro. Having a ladder that is the right size for the job is paramount to insure that the user does not have to stand on the top rung which is simply a risk not worth taking. It’s important to make sure that there is always and only one person at a time on your ladder. This is one of those cases where the more is not the merrier. Now once you’re on the ladder please just simply take your time. 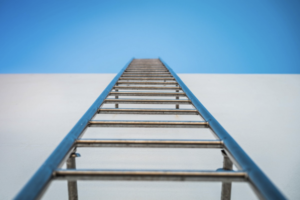 Climb slowly and deliberately and never ever attempt to move the ladder from side to side while you’re standing on it. All of these recommendations lead us back to our very first and that is stay off your ladder. Sell it in a tag sale and then pick up your phone and call Wood and Wood Seamless Gutters to have them do all the ladder climbing to get those gutters of yours cleaned properly while you enjoy your second cup of coffee. Call Wood and Wood today at 860 563 8820.
lean to the side must be rejected.